Are you looking for a time out to reenergize yourself in nature? The Swiss family Hans Peter and Beata Meier offer their herb farm “Brai Loi”. It is at once remote and yet close to the sea, a paradise for old and young, offering an insight into herbal farming. The farm is nestled amongst gentle hills close to one of the most beautiful natural beaches of Sardinia. A place where you can immerse yourself completely in nature. Remarkably quiet nights full of stars are followed by mornings full of innumerable birds who announce the arrival of another sunny day. Lodging: “Casa Rosa”, a small house in the middle of trees and wild nature offers simple comforts and a hearty atmosphere. It is well equipped with a cooking area, bath with warm water and electricity from solar panels. The air is filled with smells of thyme, marjoram, oregano and basil, since the herbal production is right next door. With your stay you support the family Meier, who emigrated 22 years ago with their tractor and circus wagon to Sardinia. Using biodynamic farming methods, they cultivate and work with a lot of love and handwork the various kitchen and tea herbs (Demeter quality). The family lives very simply and is well organized. The Meier’s have an outdoor kitchen. Piricu (Hans Peter) can give you an interesting insight into the world of herbs and if you wish, you can help out in the fields. “Brai Loi” offers many more things: hiking and biking, a beach approximately 2 km away, easily accessible on foot, bike or car. Bikes are available too if needed. This supportive vacation is meant especially for nature lovers who want to reenergize themselves in a quiet, secluded place. The hills with their picturesque rock formations, the sea with its beaches and the rock coast offer countless possibilities for this type of holiday. SUITABLE FOR Nature lovers who are independent and can take care of themselves. Breakfast, Lunch or Dinner ARE NOT offered, shopping possibilities exist in S. Priamo, 6 km away (it can be organized together with Family Meier). VIA CAGLIARI is the closest airport. The simplest possibility is to rent a small car at the airport. We can give you the name of a local rental agency who offers a reduced rental price. Taxis are expensive (Brai Loi is a minimum of 80.—Euros from the airport, approximately 70 km away and can be reached within 1.5 hours via the Superstrada. The airport and the centre of Cagliari are connected half hourly by bus. 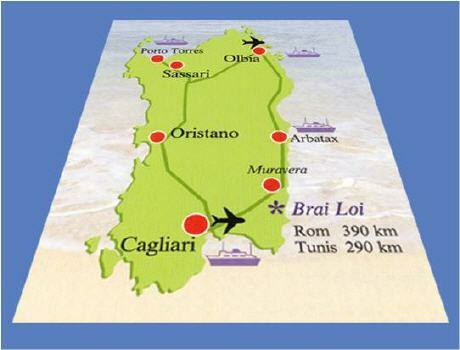 Another possibility exists between the centre of Cagliari by bus to S. Priamo (direction of Tortoli, Muravera). Piricu can pick you up in S. Priamo at Bar Number One. Via Olbia is 280 km from S. Priamo. Arrival can also happen here and the drive is then approximately 4 hours. Brai Loi offers also lodging for groups of 4 – 5 people. There are cozy spaces in the wooden house. The kitchen is outdoors under cover as it is for family Meier. Prices on demand. Mehr Info findest Du unter www.brailoi.ch.